This month’s beauty essentials list is ALL about skincare and natural makeup! I guess you can say I’m trying to soak up the last few days of summer sun and warm weather so I’m all about minimal makeup and minimal effort, but still looking good and like myself! 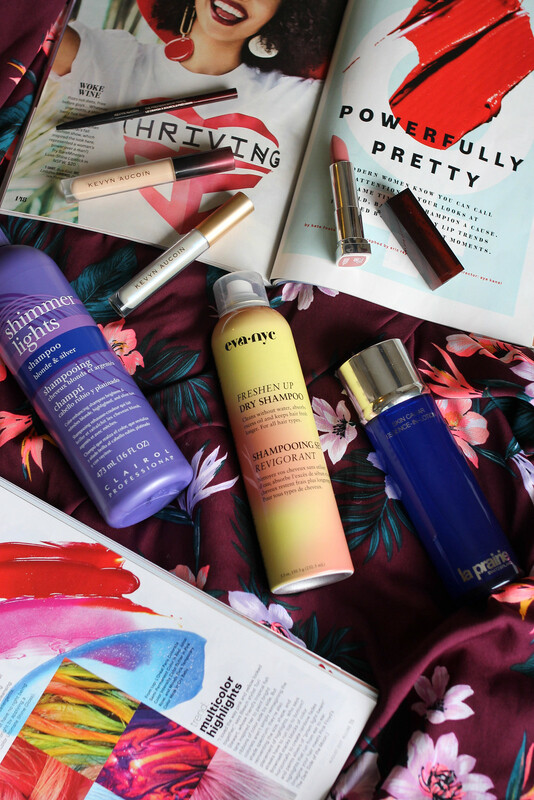 I don’t take putting together this monthly list lightly and these 7 items truly are the beauty products I couldn’t live without this month! I was a little scared to include one of them (scroll down to find out which one and why), but it’s here for a reason, so make sure to let me know if you would ever try it once you’re done reading my review! Clairol Shimmer Lights Shampoo $12 – If you have blonde hair and aren’t using purple shampoo you are missing out! 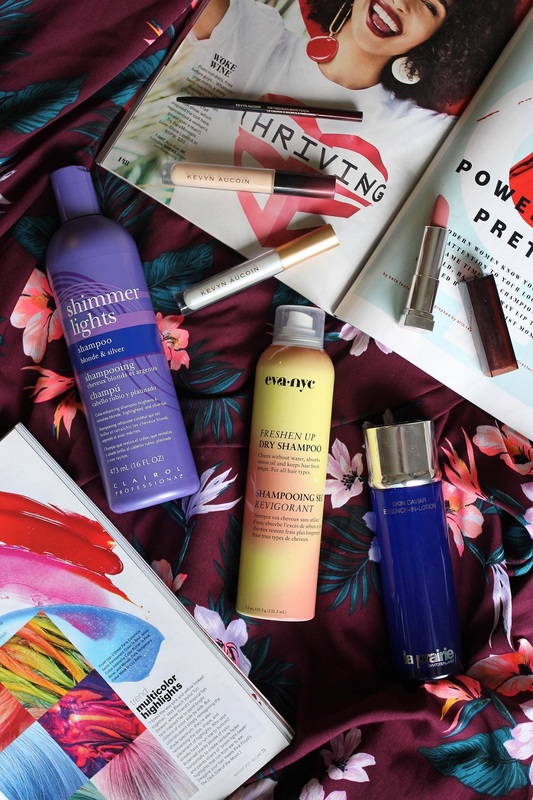 My hair gets brassy and yellow very fast thanks to my natural orangey red undertones, so in order to keep my hair in check purple shampoo is a must! 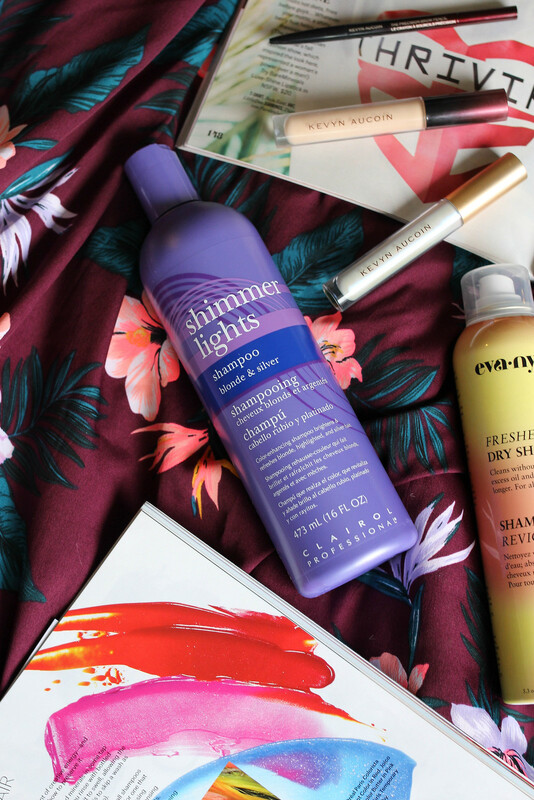 I’ve tried a bunch of different brands, but Clairol’s Shimmer Lights is the absolute best! I will warn you it’s VERY bright purple when you put it in your hands, so don’t be scared, but it’s the best. I use this about once a week especially i the summer and it keeps my hair bright and the color fresh. Kevyn Aucoin The Molten Lip Color Topcoat $30 c/o – Who would’ve thought that iridescent lip gloss would be on my list of beauty products I couldn’t live without, but this month it is! This is definitely more of a fun item, but definitely worth it! You can use it over any lipstick or on it’s own, and it elevates any look! It comes in Cyber Opal and Cyber Sky and most importantly it’s NOT sticky, which is a huge pet peeve of mine! See me wearing Cyber Sky here! Maybelline Color Sensationl Lipstick in Warm Me Up $5.59 c/o – Other than this fun metallic look I did earlier this month, my makeup routine has been VERY minimal! Light foundation, bronzer, brows (we’ll get to that next) and neutral lipstick. This shade has been my go to over the past few weeks and with a price tag under $6 it can be yours too. Kevyn Aucoin The Precision Brow Pencil $26 – Normally I’m all about powder and a brush when it comes to filling in my brows (which I HAVE to do), but ever since I found this brow pencil I haven’t used anything else! This pencil definitely lives up to it’s precision name and applies so perfectly. Somehow it also cuts my brow grooming time in half, plus it makes my brows look WAY more natural than with powder! For reference I’m wearing the shade Brunette, you can see it here. Kevyn Aucoin The Etherealist Super Natural Concealer $30 c/o – Holy airbrush concealer, this stuff is magic! 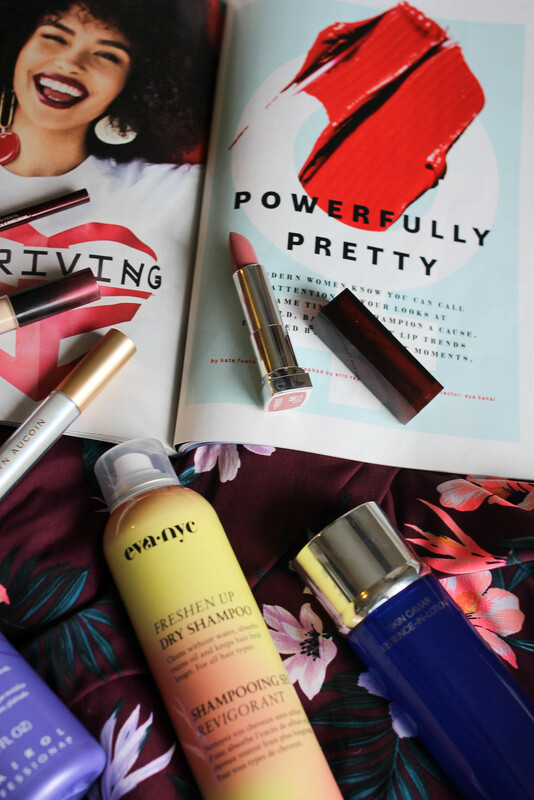 It claims to blur imperfections for a flawless finish and it does just that! I’ve been using it as my under eye concealer for the past few weeks and it’s worked like a charm. A little goes a long way and when applied with a damp beauty blender it basically melts into your skin! EVA NYC Freshen Up Dry Shampoo $11.99 c/o – I’m a dry shampoo freak. I’m honestly not sure what I would do with it. I’ve tried a ton and there are a lot that I love and even more that I hate! This happens to be one of the love ones. It works really well and smells really good! La Prairie Skin Caviar Essence In Lotion $250 c/o – I was a little scared to include such an expensive item in my “beauty products I couldn’t live without” list, but truly have been using it nonstop all month. I’m not sure I would’ve bought such an expensive product without trying it first, but it’s pretty awesome. You’re suppose to use it after cleansing and toning, but before any other products and it’s meant to prep your skin for any products and treatments to follow. My skin has actually looked amazing all month and I’m not sure if I should attribute it solely to this, but I’m sure it didn’t hurt! 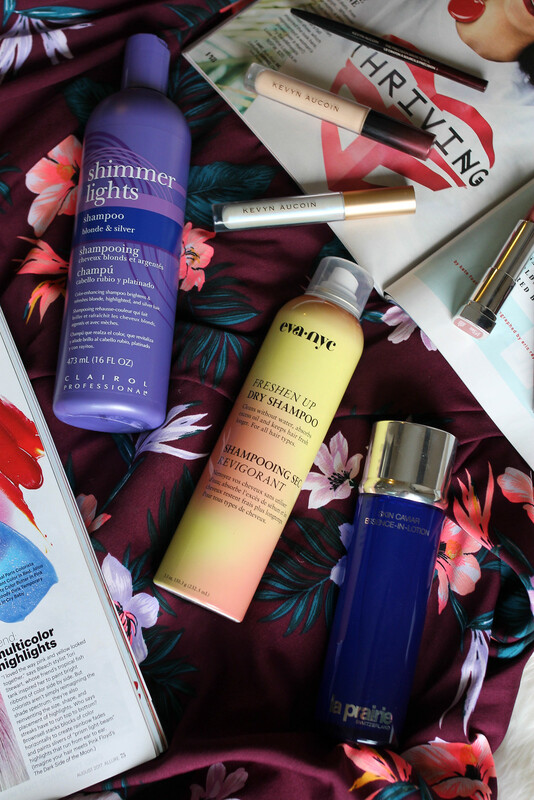 If you’re looking for more beauty reviews check out May, June and July Beauty Essentials lists + you can shop all my current favorite products right from my Beauty Essentials page!